I am a clinical psychologist at NASA’s Dryden Flight Research Center at Edwards Air Force Base in California. I have been manager of the center’s Employee Assistance Program (EAP) for 12 years. 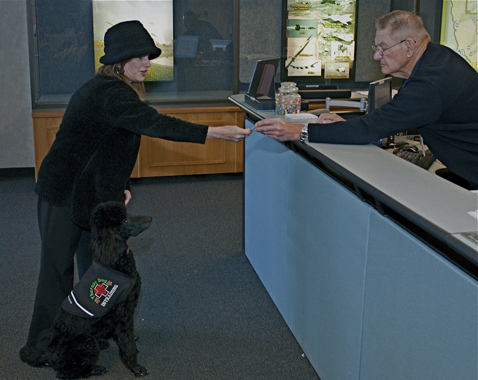 Image Right: Ella, NASA Dryden’s new therapy dog. The EAP office at DFRC is staffed by two individuals, a pre-doctoral intern named Monique and myself. We provide psychological services to employees and their dependents for problems such as depression and anxiety. We are also involved with consultations with supervisors and managers regarding employee-related problems. We lead the Critical Incident Stress Management Team and are also part of the Emergency Operations Center, which is lead by the Office of Protective Services. We are involved in training of employees on a variety of topics, from workplace violence to stress and burnout. During my time at Dryden, I have made it my goal to provide a confidential service that employees view as supporting the center’s mission. A healthy workplace is made up of employees who have good morale and whose stress is under control. I believe that the success of the EAP can be determined, in part, by the impact it has on these factors. I have always tried to look for ways to create the best EAP office possible. I look for ways to leverage my 27 years as a psychologist to help make Dryden a great place to work. There are people who have doubts as to the usefulness of such services, but it is my experience that they are in the minority. About six months ago I read about Arnold the Therapy Dog. Arnold is an English mastiff that is owned and handled by Jon Fishman, who provides his services to employees and their dependents at Edwards Air Force Base. It has been said that he is the only individual on the base who can visit the air base commander without an appointment. That says a lot in a military setting, I think. The use of animals to help humans has a long and distinguished history. Most people are aware of guide dogs for the blind and hearing ear dogs. These are called service dogs, and they are most often utilized in situations where one specially trained dog provides specific services to one human partner. The therapeutic use of dogs (and other animals) reaches much farther, however, and also includes what have come to be called therapy dogs, used by one handler for the benefit of many people. Studies have shown that nursing home residents who are given their meals in view of an aquarium consume more food and gain more weight than those served their meals in their room or in a dining area. This has a big impact on their health and overall well-being. Individuals in hospitals where therapy dogs are utilized often recover faster and report less pain during recovery. The list of the positive effect of animals on humans is long. 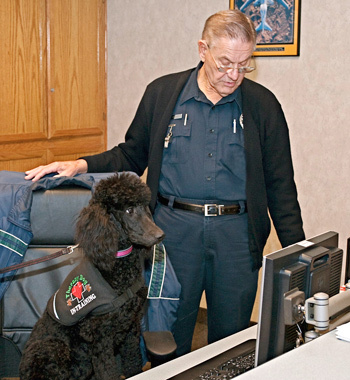 I wondered what sort of unique effect a therapy dog might have in a workplace like Dryden. I have been around dogs my entire life. When I was in college, I started raising and showing Australian shepherds. I was involved in conformation, obedience and herding-dog competitions. 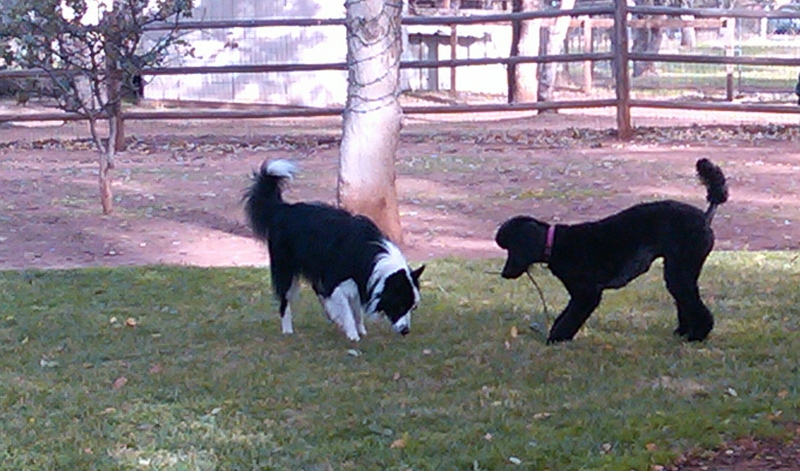 I also became involved in those activities with border collies. These are two very smart breeds and I had a really great time with this hobby for about 20 years. Marriage, children and work came along, and I had less and less time for my hobby. Today my only dog is a border collie named Jack. I pitched the idea to leaders here at the center and got their approval to give my idea a try. I had been thinking about what kind of dog would be the best to choose. Often, therapy dogs are adopted from a shelter or the Humane Society. After a lot of research I decided that I wanted to get a young dog and the breed best suited for this endeavor would be a standard poodle. For those not familiar, this breed is known for many things, among them their intelligence and solid temperament. They don’t shed and so are far less likely to trigger an allergic response in humans. I had never had contact with this breed, but from talking to others who had and with breeders, I decided to give them a try. I did some more research and found a woman who had very young puppies and a few older dogs. She took great pains to make sure that her dogs were of the highest caliber, both in physical health and temperament. I spoke with her on the phone and told her I was looking for a therapy dog candidate. She told me she had a six-month-old black female that she thought would make an ideal therapy dog. I drove to her home and met Ella. Needless to say, Ella came home with me. This would be a true adventure. I had done my homework and read several books on training a therapy dog. In my previous experiences with dogs, the relationship in terms of their work was one of “human-commands-canine.” In the world of therapy dogs, though, the partnership is different. It might best be described as “human presents canine that interfaces with other humans.” I believed I was ready for the challenge. By the end of her first week at work, it was clear that Ella’s impact on Dryden Flight Research Center would far exceed my expectations. Monique and I were honestly amazed. The reaction to even the idea of a dog at the center was immediate, wide-spread and almost exclusively positive. This was going to be a truly incredible journey—one I knew would be a challenge as well as a learning experience for all involved. I thought it would be a good idea to share this journey with others, and wondered if a blog might be a good way to do so. So many factors would be involved—Ella’s impact on the employees, the employees’ impact on Ella—and all of the challenges and lessons that surely lay ahead for Ella and me. I thought about all the ways that I could share the experiences leading up to the ultimate impact of one dog on a community of NASA employees. I decided that it was through her eyes that this blog might make the most sense. With what I was coming to realize is her patience-beyond-her-six-months-on-this-planet wisdom, I had a strong feeling she would blossom into this role which, for all of us involved, might prove to be life-changing. When I grew up in Los Angeles during the 1970s and 1980s, both of my parents were employed by Hughes Aircraft. The elusive and mysterious aerospace industry was at the core of my young life. My persistent desire to revisit and explore the industry that informed me personally and shaped s o much of the Southern California landscape led me to create my Aerospace series. 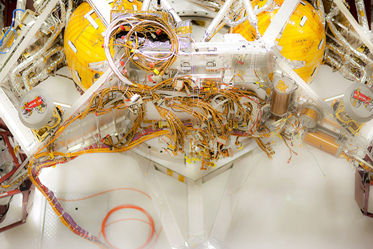 Image above right: the Mars rover Curiosity captured during assembly in a JPL clean room. Developments that have come out of this industry have had a profound effect on us as a region, a nation and a culture. Aerospace has been a crucible for some of man’s greatest scientific and technological achievements. It struck me that many Californians go about their daily lives mere miles from where these marvels are being carefully orchestrated, without even knowing of their existence. The rich history and current developments in the aerospace industry lent themselves perfectly to this project. My quest led me to NASA’s Dryden Flight Research Center, JPL, Caltech and Edwards Air Force Base, all of which are in Southern California. I was able to explore and photograph groundbreaking achievements of the past and the most phenomenal dreams for the future. 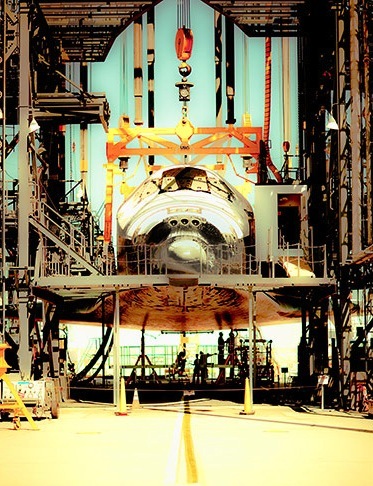 Image right: Space shuttle Discovery encased in the Mate-Demate Device at Dryden in September 2009. One of the best parts of my job is sharing with the public the details of our many research projects. On occasion, we get to meet some really cool people. 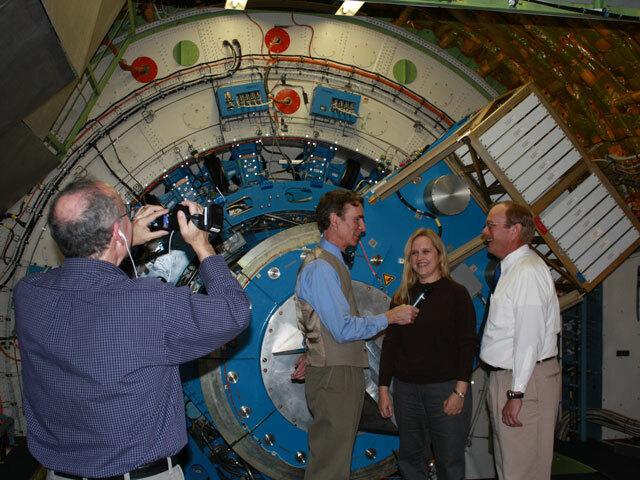 Image right: MatKaplan, Media Producer for the Planetary Society, records video as BillNye The Science Guy interviews Pam Marcum, lead SOFIA scientist and BobMeyer, SOFIA program manager in front of the German-built infraredtelescope mounted inside the 747SP aircraft. Just last week, Bill Nye The Science Guy paid a visit to our facilities to conduct interviews for an upcoming program for the Planetary Society. The focus of his visit was to learn more about the SOFIA, NASA’s Stratospheric Observatory for Infrared Astronomy. As his host, I was curious to see what he was going to be like in real life. I wondered if he was really into the science, or if it was just some act he put on to make a few bucks. Let me tell you, it is no act! As I greeted Bill and his colleague Mat Kaplan from the Planetary Society in the parking lot, before we could even finish exchanging greetings Bill had to show me the new Volt he was test-driving for General Motors. He was jazzed about the technology behind this vehicle and had to point out all the cool features. As we went inside the Dryden Aircraft Operations Facility in Palmdale, small crowds of curious bystanders started shadowing us as we walked through the hallways and hangar. Young and old, technicians, physicists, administrative and professional staff alike, the reaction of those he passed was the same: awe, admiration and sheer excitement at getting to see and meet The Science Guy! Many of our staff commented to Bill that his whimsical and often humorous approach to science had been instrumental in motivating them to choose their career paths. Now, they had an opportunity to repay the favor by showing Bill a thing or two about what they are doing in support of making great astronomical discoveries with the SOFIA. 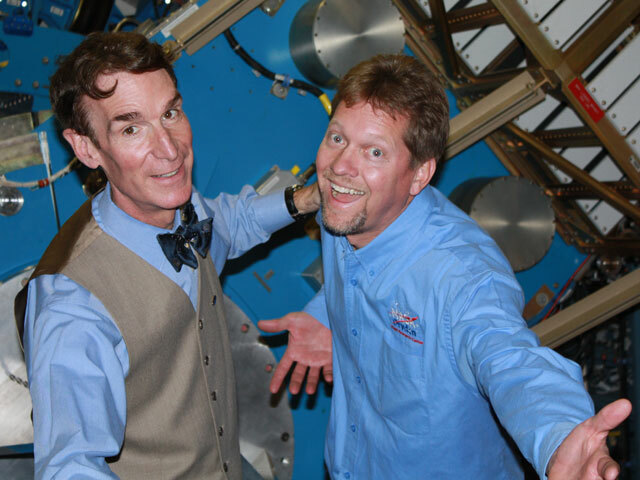 Image right: Bill Nye The ScienceGuy takes a break from conducting interviews with the SOFIA team andposed for this fun photo with Kevin Rohrer, NASA Dryden public affairsteam lead. Bill and Mat seemed to spend as much time learning about the modified 747SP aircraft and the 2.5-meter infrared telescope it carries as they did conducting interviews. Bill noted that, as an engineer, before achieving celebrity status he’d actually helped design portions of the aircraft. “How cool is that? !” he noted. As we were giving them a background briefing on the SOFIA science aspects, you could see Bill’s mind wandering into the unknown…what discoveries would this team make, how would the telescope complement other ground-based instruments…will they let me fly the plane? The walk-through tour of the aircraft brought out both the engineer and scientist in Bill. His interview questions of Bob Meyer, SOFIA program manager, and Pam Marcum, lead SOFIA scientist, were on target and are sure to make an exciting program for the Planetary Society. The story should be posted to their website, www.planetary.org, in a few weeks. This is the end of my fourth week at work. There are so many new things I get to see and do. The people aren’t so anxious, and they don’t lean down so fast when they see me. She seems calmer, too. The people know my name. I like to hear it down the hallways and when they come into Her office. When we walk into the big buildings, I hear my name come from out of doorways, or from far down the hall. Sometimes we stop and talk to the people. They touch me and I like that a lot. Image right: It’s official! Ella gets a badge and she’s ready to go to work. I feel good here. I like to walk out ahead of Her, but She tells me to come back by Her side. I don’t need Her so much anymore. I have lots of people now; luckily, they don’t come home with us – I think they just stay here until we come back. Today we went to a place to get my badge. A nice man in a blue uniform took my picture. The picture is on a piece of plastic now. It is just like Hers. It makes me feel proud, and really part of the pack here. 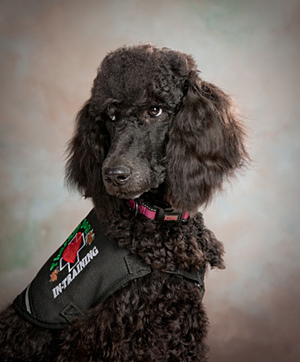 Kathy’s note – Unlike service dogs such as guide dogs for the blind, therapy dogs often start their career as adults. They are sometimes acquired from animal shelters or other rescue organizations. Starting Ella’s training when she was a six-month-old pup means that it may take a bit longer than normal to know whether she has the kind of temperament that will make her good at this. She can be tested for certification after she is one year old. But even if she passes those first tests, it doesn’t mean she will have the kind of positive impact I hope for. Ella’s first weeks have been exciting. She has blossomed from being reserved and rather overwhelmed to being overtly happy and welcoming to most of the people she meets. In fact, it is now time to start the next phase of training. She is very good on the leash, but now she is starting to want to walk ahead and take the lead. I understand that not everyone wants to touch her, and so she has to learn to wait to be told by me that she can greet someone. I am struggling with her initiative. Like working with a shy or uncertain child just coming out of their shell, there is a point at which some discipline must be applied. Timing will be very important. I think I’ll wait for a few more weeks; I don’t want to start too soon lest she become discouraged. Image right: Ella gets some cyber-security tips from Dryden officer Joe Coram. Ella had her first encounter with an aircraft tug, a substantial and noisy machine. She was unfazed when it came out of a hanger door chugging and sounding its horn as safety dictates. She was happy to stand and get affection from the driver. It was now Dryden’s turn, and Mr. McBride began to introduce Ella. It had been almost 10 minutes and I was worried that she would start to get restless and jump out of the chair. This was her big moment, and she needed to make a good impression. Mr. McBride explained that she was a therapy dog in training and part of the Employee Assistance Program. As if she were a seasoned actress making her most important audition, she took the cue and made what I think was a lasting impression: looking right at the camera, she gave her biggest, most dramatic puppy yawn ever. Laughter ensued from across the country and throughout the NASA leadership. I believe she got the part.